Faye was a long-time member and organist at Good Shepherd Catholic Church in Columbia, KY, before moving to Berkeley Lake in 2004. She and her husband, Harold Gaddis, owned and operated Harold's Steakhouse in Columbia, KY, for many years. Faye loved to travel and visited London, Ireland, the Pacific Northwest, and the Caribbean during her retirement. As a younger woman, she lived in exotic locales including Hawaii, Guam, and Japan. Faye loved to read, volunteered at several local schools, and was a die-hard UK Basketball fan. She leaves behind many loyal friends and loving family in both Kentucky and Georgia. Faye Gaddis, age 88, of Berkeley Lake, GA, passed away May 29, 2018. A Memorial Service will be June 1, 2018 at 4:30pmCT/5:30pmET, at the Lake Berkeley Chapel, 4043 Berkeley Lake Road, Berkeley Lake GA.
Faye was preceded in death by her husband, Harold Gaddis and daughter, Viki Young. Great-grandchildren: Caleb Pendleton, Peter Pendleton. 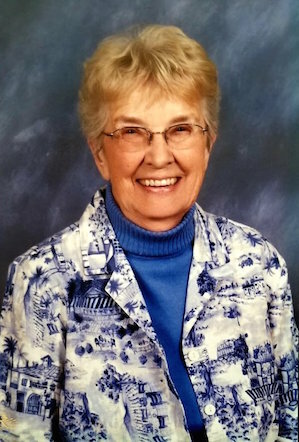 Faye was a long-time member and organist at Good Shepherd Catholic Church in Columbia, KY, before moving to Berkeley Lake in 2004. She and her husband, Harold, owned and operated Harold's Steakhouse in Columbia, KY, for many years. Faye loved to travel and visited London, Ireland, the Pacific Northwest, and the Caribbean during her retirement. As a younger woman, she lived in exotic locales including Hawaii, Guam, and Japan. Faye loved to read, volunteered at several local schools, and was a die-hard UK Basketball fan. She leaves behind many loyal friends and loving family in both Kentucky and Georgia. In lieu of flowers, donations may be sent to: Berkeley Lake Elementary School PTA, www.blespta.org, Lake Berkeley Chapel, www.blchapel.org or The American Red Cross, www.redcross.org. Arrangements entrusted to: Crowell Brothers Funeral Homes & Crematory, 5051 Peachtree Ind. Blvd., Peachtree Corners, GA 30092 (770) 448-5757. 2018-05-31 - 210 Greensburg Street, Columbia, KY - Photo from Stotts-Phelps-McQueary Funeral Home.